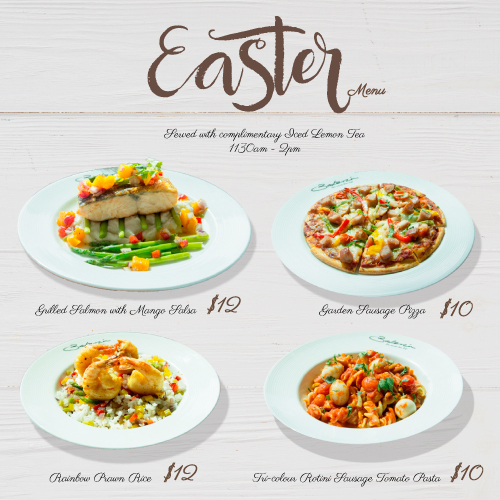 Monday | April 8, 2019	Inspired by the Easter theme, Bakerzin's chefs has curated a brand new seasonal lunch special featuring easter-inspired dishes, available for a limited period from 8 to 30 April, between 1130am to 2pm at all Bakerzin outlets except Gardens by the Bay and Farrer Park. Savour these delicious treats such as: Rainbow Prawn Rice, Grilled Salmon with Mango Salsa, Garden Sausage Pizza and Tri-colour Rotini Sausage Tomato Pasta. Hop down to Bakerzin outlets this April and get your tummies-tucked!